The AHA with the cooperation of other organizations, has compiled key resources to enhance educational efforts and raise awareness around advance directives. An advance directive is your life on your terms. Whether you're 18 or 80, documenting your wishes today means your family won't have to make heart-wrenching decisions later. To help patients, families and the hospitals that serve them, the American Hospital Association (AHA), with the cooperation of other organizations, has compiled key resources to enhance educational efforts and raise awareness around this important issue. We encourage everyone to talk with their family, their friends, their doctor. Know the options. Decide what's right for you. And then put it in writing. 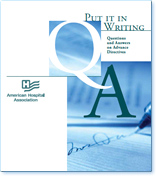 This AHA resource provides basic facts about advance directives and encourages patients to explore their preferences for care at the end of life. This card alerts healthcare workers that patients have talked to their family about advance directives and provides contact names and numbers. Simply print, then fill out the card and carry it in your wallet. Please view the television spot (English or Spanish). You are welcome to modify with your organization's identity and information. Please contact AHA if you would like a downloadable version of the video files to adapt for use in your community.